Once a village with gloomy prospects due to improper land development, habitat degradation, pollution, decreasing income, aging, etc., Gongrong community was determined to transform in 2003 by following principles in line with those of the Satoyama Initiative. Based on literature review, observation and interviewing community members, it is revealed that transformation of Gongrong community went through three overlapping stages: to halt further environmental degradation (2004-2007), capacity building (2005-2011), and implementation of strategic plan (2012-2016). With the long-term capacity building provided by the Soil and Water Conservation Bureau (SWCB) and other partners, and the motivation and wisdom of a group of elders, Gongrong community was able to plan out its vision and goals through a participatory process and implemented its strategies and actions collectively to revive its SEPL. Beginning in 2007, fishing was banned in Balian stream that flows through the community and the Balian Stream Conservation Watch began its patrol along the stream regularly to stop illegal fishing. By stopping further land degradation and initiating environmental friendly activities, the empowered community has cleaned up its environment, revived abandoned agriculture land by cultivating diverse crops that can be harvested in different seasons, and brought back biodiversity that was once vanished. In addition to the increasing household income, the number of young farmers joining in Gongrong has been rising. More importantly, by encouraging and collaborating with the neighboring Ankang community to join force and revive its SEPL according to the principle of the Satoyama Initiative, Gongrong and Ankang communities has served as an OECM that helped expand the effectiveness of biodiversity conservation from the adjacent Yangmingshan National Park to this human-nature interactive landscape. The Gongrong community which manages a 210 ha agricultural production landscape is adjacent to the Yangmingshan National Park (YNP), a protected area (Fig. 1). The community is surrounded by secondary forest in the hilly area, and the Balian stream, with its rich water supply, flows through the landscape and provide clean water for drinking and irrigation (Fig. 2). Annual precipitation around Gongrong is about 3,000mm, and average annual temperature is around 22 ℃, with the highest temperature 37.8 ℃ and lowest temperature 2.3 ℃. It is hot and dry from July to September, though typhoon may bring heavy rain during this period, and cold and wet from November to March. Population in Gongrong is about 400 in 2017 and the main crops now include rice, Manchurian wild rice Zizania latifolia, vegetable and fruits. Figure 1. Relative location of Gongrong community, a neighboring Ankang community, and the Yangmingshan National Park (Source: Pei-Sheng Gao). Figure 2. A bird’s-eye-view of the production landscape managed by Gongrong community. Balian stream (arrow) flows from the Yangmingshan National Park (background) through Gongrong community (left of the Balian stream) and the neighboring Ankang community is located at the right side of the Balian stream. Over 300 years ago, immigrants from western Fujian of China settled here and formed communities along the Balian stream which provides quality water for the settlements and irrigation. The hilly terrain was suitable to develop terraced fields for rice growing and rice became a staple crop of Gongrong. The small community has since depended on agricultural production for its livelihood. However, in late 1990s, the upstream areas of the Balian stream watershed was devastated by illegal landfill, open-air trash burning, water interception and improper development of steep hillside in the upstream forest (Fig. 3), due to neglect of duty and corruption of local officers. The heavy rain brought by super typhoon Herb in 1996 caused serious landslide in this area and two people were buried by mud flow. Degradation of upstream together with problems within the midstream settlement, including mismanagement of domestic sewage, overuse of chemical fertilizer and pesticides, increasing abandonment of agricultural land, and improper stream construction, resulted in degradation of this production landscape, reducing income from farming, disappearing of traditional knowledge, in addition to the loss of biodiversity. At the same time, Taiwan was in a process of economic takeoff, young people began to move to cities seeking for job opportunity, leaving Gongrong an aged population with decreasing productivity. Figure 3. Improper land development (upper left), illegal dumping of waste (upper right), illegal open-air trash burning (lower left) and the serious landslide caused by super typhoon Herb in 1996 (lower right) in the upstream area of the Balian stream. Determined to reverse the vicious circle of environmental, economic and social devastation and regain the vitality of a production landscape that was once natural and beautiful, a group of elders in the Gongrong community decided to take advantage of the capacity building opportunity provided by the “Rural Manpower Training Program” of the Soil and Water Conservation Bureau (SWCB) in 2005, followed by the “Rural Regeneration Incubation Program of the SWCB between 2008 and 2011 and a series of ‘learning-by-doing’ activities. The collective action of the Gongrong community, which has continued for 12 years, has restored local biodiversity and the agricultural production landscape. To record and analyze the successful case of Gongrong community and its efforts to restore the socio-ecological production landscape and ecosystem services. To demonstrate the SEPL managed by the Gongrong community is an “other effective area-based conservation measure (OECM)” and report its contribution to the Aichi Biodiversity Targets, particularly Target 11. Methods used in collecting information in this thematic review included literature review, document search, observation and interviewing members of the Gongrong community. Documentation on planning of annual management goals and activities, project reports, annual review of the results of activities, etc., of the Gongrong community are well maintained by the second author and can be traced back to 2003. The SWCB also kept good record for community development, especially the annual budget and report for projects implemented in every community they have worked with, including Gongrong. Transformation of Gongrong community went through three overlapping stages: to halt further environmental degradation, capacity building, and implementation of strategic plan. Before reviving the socio-ecological production landscape (SEPL) of Gongrong, the community had to stop further pollution and land degradation. This was done by persisting on appealing to township office, township representatives, and county government to strengthen law enforcement and stop illegal activities in the upstream area of the Balian stream watershed. Beginning in 2007, Balian stream was closed to all fishing as fisheries and aquatic resources dwindled due to overexploitation and pollution. Members of the community formed the Balian Stream Conservation Watch (BSCW) voluntarily and began its patrol along the stream regularly to stop illegal activities. To build up their capacity in reviving their community, members of the Gongrong community participated in a series of training workshops and/or courses offered by the SWCB. From 2005-2007, training courses were provided under the SWCB “Rural Manpower Training Program” (Table 1). Under the “Rural Regeneration Incubation Program” of the SWCB from 2008-2011, additional members of Gongrong community received more than 96 hours of training with members of neighboring Ankang community (Fig. 1, 2; Table 2). There are four stages of capacity building in the “Rural Regeneration Incubation Program”. At stage 1 (Local Concern stage), community members first learned the basic concept and policy of rural development program and had a better understanding of the place where they live. In 2009 they moved on to the Intermediate stage and learned all kinds of environmental issues that are common to rural communities and the cause and consequences of environmental problems. At the Core Competency stage in 2010, members of the two communities were taught to conduct local resource survey, to think over and start improving their agricultural environment. All these ‘learning-by-doing’ activities were decided and implemented by members themselves but the labor cost and material purchased were covered by the SWCB. At the final Regeneration stage in 2011, members of the two communities learned to draft and outline the vision, goals, strategy and action plan separately to regenerate their communities based on the survey results and collective discussion, and several try-out activities were initiated. Table 1. Training workshops or courses taken by the Gongrong community from 2005 to 2007. Table 2. Stages and focus of training for Gongrong community and Ankang community under the “Rural Regeneration Incubation Program” of the SWCB from 2008 to 2011. The final draft of the regeneration plan of the Gongrong community resulted from the process of the “Rural Regeneration Incubation Program” was submitted to the SWCB for reviewing. After the approval of the plan and its budget by the SWCB in 2011, Gongrong community was able to implement its regeneration plan in 2012-2016. With the training from the workshops, members of the Gongrong community were able to identify issues that they need to handle before the vision and goals of their strategic plan can be realized and find the necessary assistance, e.g. experts, partners, resources, etc., and solution by themselves. Since 2010, members of the community meet at least once every month to discuss community affairs. They keep good documentation on their achievement each year and plan out actions to be taken in the following year. The draft plan of the Gongrong community was so good that it won the first place of the “Rural Regeneration Draft Plan Contest” organized by the New Taipei City in 2012. In the process, members of the community also learned to create a core cadre of community leaders so that they could encourage other community members to take part in the training and provide their ideas and vision so that the community could move forward together. In addition to supporting capacity building, the SWCB also provided funding support of about NTD39,000,000 (USD1,300,000) on improving the physical infrastructure, e.g., trails with improved safety, stabilizing stream bank, of the Gongrong community during this period. The concept of area-based conservation is investigated on site with reference to rural regeneration efforts implemented by the Gongrong community in the past 12 years. Transformations of Gongrong community through collective effort can be witnessed in many aspects. For instance, in 2005, the first year when training courses offered by the SWCB became available, 20 members registered but only 6 completed the training at the end. To improve this, the elders asked the members to choose and decide what kind of training courses they need and want by themselves. The result was a well-received training program with increasing participation. Nowadays the community continues to hold training workshops or courses based on its plan and needs, which are attended by more than 100 community members, or 1/4 of the Gongrong population, regularly to improve the farming and management skills of participants. From 1990s to 2003, improper land development, illegal dumping, and water pollution in upper stream as well as overfishing led to a dying Balian stream. Overuse of chemical fertilizer led to eutrophication of the stream, overuse of pesticides and herbicide led to decreasing quantity and quality of agricultural products which were much less competitive in the market. The environmental degradation was apparent, e.g. vegetation covers along stream bank decreased, no frog calling could be heard in the summer, dead fishes were frequently found floating on top of the polluted water, bird species and population dropped significantly, pest outbreak became more frequent, disaster risk and loss also increased. Even worse, local members were not aware of environmental degradation, including the disappearance of many local species. At the same time, the Taiwan Water Company had a plan to withdraw water from the Balain stream and send it somewhere else. Local politicians secretly made a deal with the water company and sold out NTD 40 million (USD1.6 million) worth of water right without prior informed consent of the community. When the water company began to construct water delivery pipeline in Gongrong community, community members were shocked by tons of huge pipes for installation. Worrying the loss of their water resource and the potential socio-economic impact, members of Gongrong took a strong stand against this ‘development’ project. After protest and negotiation, the pipeline project came to a halt but did not stop completely. However, this incident stimulated local awareness of the importance of nature and a healthy landscape. The incident also helped ignite an extraordinary environmental transformation of Gongrong. Through collective actions, members of Gongrong community successfully stopped the improper development and illegal dumping in the upstream area. Garbage dumping, either deliberately or accidentally, were first discouraged and later prohibited. Useless facilities were removed. The self-organized BSCW has been patrolling along the stream regularly since 2007 to clean the stream and stop illegal fishing since then (Fig. 4). The BSCW also reported any illegal activities to the District Office, City Government, or through media. By keeping the stream environment clean, restoring the stream bank vegetation, and stopping illegal fishing, the patrol team found that the migratory Japanese mitten crab (Eriocheir japonicas) had reappeared in upstream of Balian. Population of other native fishes such as Taiwan shovel-jaw carp Varicorhinus barbatulus, ray-finned fishes Zacco pachycephalus and Acrossocheilus paradoxus became much more abundant than before. Figure 4. Overfishing along the Balian stream in the past (left). Members of Balian Stream Conservation Watch (BSCW) patrol along the stream regularly to stop illegal fishing activities. The Gongrong community, sponsored by the SWCB, also built several small-scale, low-cost, constructed wetlands to treat domestic sewage by themselves (Fig. 5). A series of 5 ponds was installed along the farmhouse to clean up the sewage into water higher in dissolved oxygen, lower in temperature and minimal in bacteria content, so that sewage can be purified before flowing back to the Balian stream. In addition to minimize the impact of farmhouse waste water to Balian stream, particularly to downstream members, and agricultural environment, these wetlands also serve for environmental education purposes. 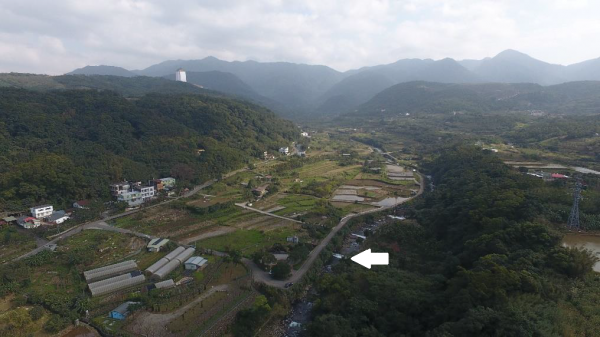 By now a total of 5 constructed wetlands for sewage treatment have been built along the Balian stream and many more in other rural arears of Taiwan. Figure 5. Members of Gongrong community building constructed wetlands to treat domestic sewage together (left). Constructed wetlands are used for environmental education (right), in addition to its sewage treatment function. The increased biodiversity, or a healthier environment, in Gongrong is evidenced by more wild plants in the field, more snails, crabs, and fishes in the stream, more frogs in the ponds, and more dragonflies and less mosquitos. Members in the community also noticed more species of birds, including the crested serpent eagle Spilornis cheela which is a protected species, over the landscape (Fig. 6, 7). A survey on aquatic organisms will be conducted in the coming year. Figure 6. Beautiful landscape of the Gongrong community after restoration. Figure 7. 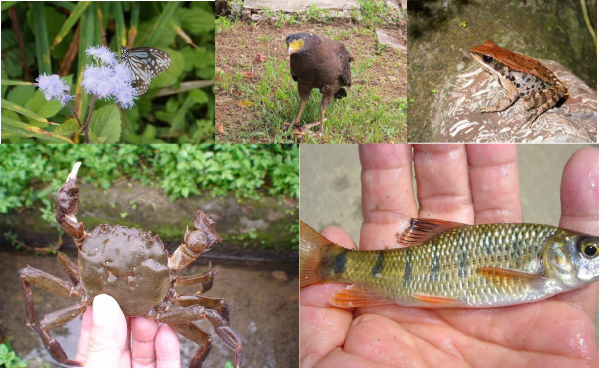 Samples of species diversity in Gongrong after restoration: Clockwise from top left, blue tiger Tirumala sp., crested serpent eagle Spilornis cheela, Latouchte’s frog Hylarana latouchii, ray-finned fish Acrossocheilus paradoxus and Japanese mitten crab Eriocheir japonicas. By cleaning up pollution and environment, farmers were able to cultivate land that had been abandoned for years. Cultivated land doubled from less than 21 ha in 2011 to 52 ha in 2017. Farmers were encouraged to apply eco-friendly or organic farming practices and farmers who still practice conventional farming were taught not to overuse pesticides and fertilizer. 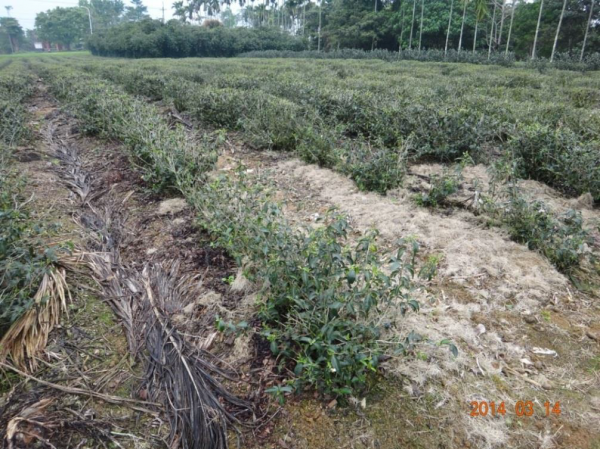 The area of eco-friendly or organic farming in Gongrong community increased tremendously from 1.3 ha in 2011 to 23 ha in 2017, indicating a dramatic reduction of pesticide application. Number of crops planted by farmers increased from 1 to 12 during the same period. This crop diversification expanded production related activities on various crops and reduced pest outbreak risk as well as market risk. Full-time farmers increased from 24 to 46 and part-time farmers from 17 to 52. Most of the new farmers are young people. A farmers’ market was opened in Gongrong community in 2012. The market only sells eco-friendly or organic farming produce on weekend with the intent of helping local farmers engaged in eco-friendly farming practice sell their produce and consumers get access to fresh and zero residue produce. More and more consumers are willing to drive all the way from urban area to Gongrong for leisure and buy fresh food of good quality. Average annual income of those farmers who are willing to disclose (N = 19) increased from NTD10,000 in 2011 to NTD170,000 in 2016. This amount of income seems to be low at the first glance. However, this is a huge progress comparing to zero income of these farmers before year 2005. As farm land restored, water source cleaned up, more types of crops than the traditional wild rice being cultivated, Gongrong community is preparing for the next stage of further production diversification. For example, they are learning to raise chickens and aquaculture, to process and add values to their agriculture products, etc., to suit farmers’ individual difference and increase their income. In addition, with the clean and beautiful landscape, the eco-friendly produce, and a successful story of transformation, Gongrong community has been reported by news media and attracted many visitors who are willing to pay for an interpretation tour guided by community members. Such a source of increasing income was not included in the above-mentioned income increase from primary agriculture production. Therefore, it is foreseeable that the income generated after the transformation of the community will continue to increase. During the 1990s when Gongrong community lost its momentum of progression, a majority of the male members of the community became addicted to drinking and gambling, reflecting a depression of the local people in general. To stop this social erosion, a dance teacher was invited to teach housewives dancing at night. The housewives then encouraged their husbands joining the dancing class. This strategy turned out effective in replacing the habit of those gambling addicted people to a healthier one without much conflict. In response to an aging society, Gongrong community has also developed a network of eldercare. The District Public Health Center and neighboring hospitals have been providing volunteer medical consultation and free clinic. Elders are encouraged to participate in physical activity as a routine. By initiating such community programs, e.g. dancing, eldercare and physical activity, and other types of social activities and encouraging people to take the training courses that they needed and interested in, members of the community became more and more enjoyable in participating in community activities, discussing community affairs, learning among themselves and from invited experts, planning, finding solutions and working together to solve problems collectively, and the cohesiveness of the community increased tremendously. While implementing their rural regeneration plan from 2012 to 2016, Gongrong’s transformation drew the attention of the news media. The increasing number of tourist provided an opportunity for environmental interpretation and education. The farming field trip and ecological camp offered by Gongrong community have been attended by many families, school kids from Taipei Metropolitan. These activities helped raise public awareness of the conservation as well as the sustainable use of biodiversity. In addition, adjacent Ankang Community was influenced by the Gongrong community and the two communities have collaboratively maintained their Balian irrigation ditch which has a history of nearly 200 years (first built during the reign of Emperor Daoguang of the Qing Dynasty from 1820 to 1850). This tradition of regular maintenance activity has duel functions: economically to safeguard the water source for irrigation and culturally a heritage that connects with the pass generation and the land (Lin, 2014). The recognition and protection of the associated cultural value also lead to positive biodiversity outcomes (Fig. 8). Figure 8. Community members voluntarily maintaining trail and irrigation ditch (left) and fixing trails in the field (right) using traditional technology. The Ankang community, with an area of 1,520 ha, shares the Balian stream with the Gongrong community. In fact, Balian stream marks part of the boundary of both communities. Therefore, a clean Balian stream associated with community health, productivity and regeneration has been of long standing interest to both Gongrong and Ankang. The Balian Stream Rural Regeneration Promotion Committee, a voluntary cross-community organization, was established in 2008 to promote regionally rural development along the Balian stream. The Committee included 3-5 members from each of the three communities located in Balian stream watershed. The Committee members met periodically and discussed large-scale, inter-community issues and how to work at synergy. The mission of the Balian Stream Rural Regeneration Promotion Committee was considered fulfilled and came to an end in 2010. Gongrong community and Ankang community have kept their close ties until now though each community drafted and implemented its own rural regeneration plan separately. A large part of the Ankang community is located within the boundary of the Yangmingshan National Park. 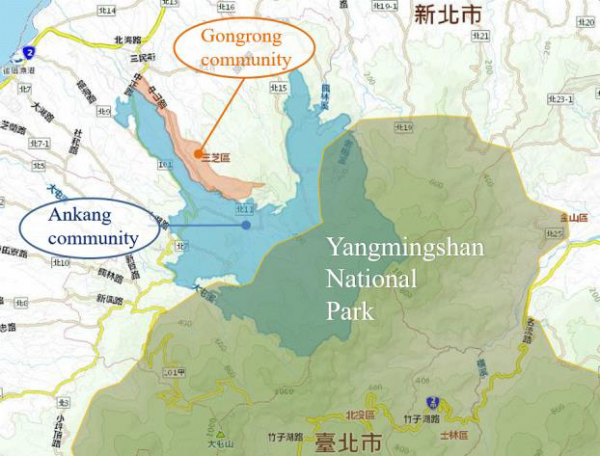 Geographically, Gongrong community, Ankang community and Yangmingshan National Park (YNP) form a continuous landscape (Fig. 1). Restoration of the SEPL by Gongrong and Ankang Communities ensured the sustainable use of biodiversity that is complementary to the aims of the adjacent YNP as a protected area, i.e. conservation of biodiversity. The area of YNP, Ankang community, and Gongrong community is 11,340 ha, 1,520 ha, and 210 ha., respectively. In other words, the combination of eco-friendly management of the SEPL of the Gongrong and Ankang communities (1,730 ha) significantly increases the effective conservation area of the YNP. An ‘other effective area-based conservation measure’ (OECM), as referenced in Aichi Biodiversity Target 11, is “a geographically defined space, not recognised as a protected area, which is governed and managed over the long-term in ways that deliver the effective and enduring in-situ conservation of biodiversity, with associated ecosystem services and cultural and spiritual values.”The core difference is that while protected areas (PAs) should have a primary conservation objective, an OECM should deliver the effective and enduring in-situ conservation of biodiversity, regardless of its objectives (IUCN WCPA, 2017). Laffoley et al. (2017) suggested that for a given measure to count as an OECM under Aichi Target 11, the measure needs to simultaneously meet ALL of the following principles: 1) achieves the in situ conservation of biodiversity; 2) is additional to existing protected area designations; 3) is long-term in implementation; 4) provides demonstrable evidence of conservation outcomes; 5) applies to a definable and describable area; 6) has active governance that delivers measures to achieve conservation. The SEPL managed by Gongrong and Ankang Communities is largely privately owned and has well defined area which has persisted for centuries. The primary objective of management of this SEPL is agricultural production instead of conservation. This SEPL has been restored by collective action of members living in these two communities. The pollution was eliminated, pesticide residue in the soil disappeared, the stream became clean and the environment becomes much more natural than before. The SEPL began to deliver effective and enduring in situ conservation of biodiversity through eco-friendly or organic farming and sustainable use of biodiversity. Migratory crabs, fishes, dragonflies, frogs, lizards, snakes, birds, and mammals have come back and diverse crops have been planted. The cohesiveness of the community members, the regular meetings and discussion among them, and the continuing education and training courses to improve their knowledge and skills helps ensure the persistence of actions to fulfil their vison of ‘making a good living on your home landscape’ and the goal of maintaining healthy ecosystems. These area-based, long-term measures have and can continue to achieve the in situ conservation of nature as a whole. In other words, the SEPL managed by Gongrong and Ankang communities meets all 6 principles simultaneously and can be considered as an OECM, particularly the category of “ancillary conservation” which refers to areas that deliver conservation outcomes as a by-product of management activities even though biodiversity conservation is not a management objective (IUCN WCPA, 2017). In recognition of a general lack of connectivity, there are a large number of global initiatives aiming to develop corridors between PAs to allow movement of animals and plants (Leadley et al., 2014). Gongrong and Ankang communities, however, are physically and biologically connected to the YNP and do not require additional effort or resources to develop corridors between them and the PA to expand the effective conservation area of the YNP and buffer YNP from anthropogenic pressures such as habitat degradation (Aichi Target 11). The restored SEPL also help enhance the resilience of the two communities and of the YNP, store more carbon in this area (Aichi Target 15), and prevent extinction and aid recovery of threatened species, e.g. crested serpent eagle (Aichi Target 12). Furthermore, the management or maintenance of PA and/or corridors between PAs can be expensive. By contrast, a SEPL managed by local communities such as Gongrong and Ankang do not require any cost for biodiversity conservation. In other words, ancillary conservation that leads to OECM nearby PAs can be much more cost-effective than establishing corridors for conservation purpose only. Such cost-effective measures ought to be evaluated to help provide incentive for promoting ancillary conservation that leads to OECM in the future. In addition to the above-mentioned outcomes, through a series of capacity building programs, “the learning-by-doing” practices, and collective planning and implementation of their rural regeneration plan, the Gongrong and Ankang communities have increased the awareness of their members on the value of biodiversity and their capacity in taking actions to conserve biodiversity (Aichi Target 1, 19). The collective actions of the two communities in cleaning up their environment, implementing sewage purification process, applying eco-friendly farming also help meet Aichi Target 4, 7, and 8. The restored SEPL that provides many important ecosystem services, including the provisioning services such as crops and clean water; regulating services such as regulation of floods, drought, pest and disease; supporting services such as nutrient recycling and pollination; and cultural services such as education, leisure and tourism, and the training courses on improving agriculture production skills and knowledge that are open to all community members help improve the social economic condition and livelihood of all members of the communities, including those of women, the poor and vulnerable (Aichi Target 14). Finally, the SEPL restored by Gongrong and Ankang communities helped ensure that the areas in which traditional knowledge, innovations, and practices of local communities have developed and this in turn helped achieve Aichi Target 18. Land-use change around PAs often leads to reduction of their effective size and limits their ability to conserve biodiversity (Hamilton et al., 2013). In the case of the Gongrong and Ankang communities, however, restoration of the SEPL helps increase the effective size and conservation effectiveness of the YNP. There are many other communities which have patches of farm land of various sizes surrounding the YNP. If these production landscapes could be well managed and deliver conservation outcomes, they could offer great opportunities for the YNP to expand its conservation area further and reduce the external threat to its core area. Now that the successful transformation of the Gongrong and Ankong communities has attracted much attention of the public, many communities, including those nearby the YNP, want to visit Gongrong and Ankang and learn from them. The New Taipei City government has recently expressed an intention to promote eco-friendly farming in the regions surrounding the YNP, using the successful case of Gongrong and Ankang. It is hope that, with the collaboration of relevant stakeholders, a continuous expansion of SEPL that meets the principle of the Satoyam Initiative and of the OECM can be realized in northern Taiwan. Continuous, long-term (in this case over 10 years) capacity building is pivotal to the transformations of the Gongrong community and the restoration of the socio-ecological production landscape (SEPL). A healthy environment is the foundation of sustainable rural economy and livelihood. A SEPL that delivers effective and enduring in situ conservation of biodiversity through eco-friendly or organic farming and sustainable use of biodiversity can be recognized as ‘other effective area-based conservation measure’ (OECM) as defined by Aichi Biodiversity Target 11. IUCN WCPA, 2017. Guidelines for Recognising and Reporting Other Effective Area based Conservation Measures. IUCN, Switzerland. Version 1. Leadley, PW, Krug, CB, Alkemade, R, Pereira, HM, Sumaila UR, Walpole, M, Marques, A, Newbold, T, Teh, LSL, van Kolck, J, Bellard, C, Januchowski-Hartley, SR and Mumby, PJ. 2014. Progress towards the Aichi Biodiversity Targets: An Assessment of Biodiversity Trends, Policy Scenarios and Key Actions. Secretariat of the Convention on Biological Diversity, Montreal, Canada. Technical Series 78, 500 pp.